In Australia, it’s Day Three of Dry July for thousands of people. They’re raising money for such a great cause and on top of that they are challenging themselves to alter their life for 31 days. Are you participating? Or maybe people in your workplace or your loved one. I believe Day Three is the most challenging. For those who are going dry (as in no alcohol) you need the inner strength, courage and willpower to make it through this day. Once Day Three is over, it should be easier on many levels. I suggest while you count the days of July (28 to go), you read a book which will help you through the Challenge. Not any book, a book about behaviour change. The attentiveness we place on what’s going on around us and the awareness of how the environment impacts on our behaviour choice are the two critical factors which may help you change your behaviour. Read that statement three times. Whilst I doubt you’ll achieve the behaviour change of stopping drinking, you’ll read about tools to help you survive and manage your way through the next 28 days! So, who can honestly say that they have made a positive behaviour change? 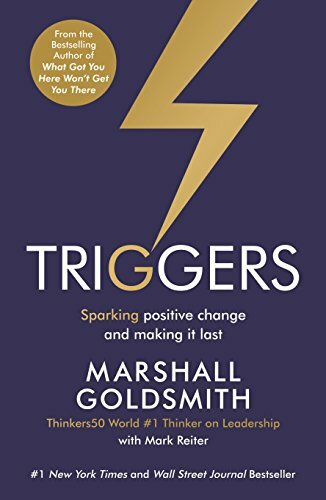 Marshall Goldsmith launched his book Triggers to help us move closer to the person we want to be! We all want to be skinnier, more fulfilled, happier, healthier yet doing that is bloody hard – it’s almost impossible. 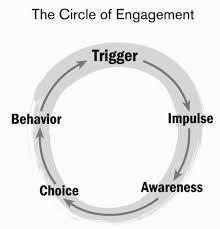 A trigger is any stimulus that reshapes our thoughts and actions. In every waking hour we are being triggered by people, events, and circumstances that have the potential to change us. Has something occurred in your life what has made you change? What’s the most memorable behavioural change you have made? 1. Meaningful Behavioural change is very hard to do. 2. No-one can make us change unless we truly want to change. We are stuffed as behaviour change is the critical expectation of every parent, teacher, manager, sports coach and partner. We want people to be politer, more loving, more punctual and more innovative and accountable. Right? So, are we kidding ourselves to have this expectation when we now know the reality. How’s this question: Have you become the person you want to be? I love this question as I truly believe that we can become various versions of ourselves. There was the young version. The married version. The parent version. The mid life crisis version. I hear this all the time in my work. Assessing the interplay in our lives between these two forces – the environment and ourselves, is how we become the person we want to be. However, for some (or many) who lack the structure in their lives to execute their ambitions – they don’t change. As Marshall says, we are visionary Planners but blurry-eyed Doers! The reason why people don’t become the person they want to be is because of the environment. For those of you who are participating in Dry July, I have one big suggestion – you need to be actively aware of the environment you place yourself in over he next 28 days. Don’t walk past the pub after work. Don’t have wine in the fridge. Drive to social events and be the designated driver. Go to cafes and restaurants which don’t serve alcohol. · The power of the wording of our self-coaching questions will determine the quality of the outcome. I’ve listed Marshall’s six questions below. · AIWATT – Am I willing currently to … e.g. make an investment in my well-being by drinking only water today. By asking ourselves this question we are delaying the time between the trigger and the behaviour. · Selecting and creating the right environment to achieve positive change – it’s more important than the thinking of the change itself. · We get better with structure – if we stick to our script, we enable repetition which is the key to change. 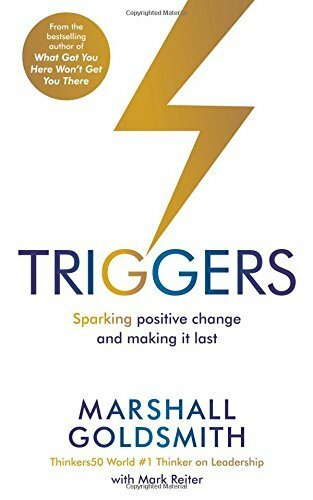 Triggers is about your personal change (and making it last) which has a positive affect on people we influence. Let’s not confuse behavioural change with an epiphany or change in career – we’re talking about serious change in what you do and say. For example, it’s how you choose to talk with someone. Rather than always retaliating in conversation, proving you’re right and they are wrong, you just let it hang and evaporate. This is a major change and it’s likely it will influence the change in the other person as well. · Did I do my best to set clear goals? · Did I do my best to make progress toward my goals? · Did I do my best to find meaning? · Did I do my best to be happy? · Did I do my best to build positive relationships? · Did I do my best to be fully engaged? I’ve been testing these questions out. I have written them on an index card and they sit on my desk. I find that these questions are challenging my desire to want to change as well as the change I am seeking. And what they do is help me become more aware of the environment which have prevented or helped me achieve the response I am seeking. So, let’s aim to be awake to what is going on around us – let’s pay attention and minimise what we’re missing and if we do this we are more likely to be actively participating in our environment, with the people who matter most. Our behaviour creates a trigger that itself generates more appropriate behaviour from the other person. How good is that?! That’s what we want our leaders to conscious of. When we lack awareness, we are easily triggered. The gap between trigger to impulse to awareness is instantaneous. That's the sequence. If you’re not inclined to read, then at least watch Marshal Goldsmiths YouTube Channel – they are gold! If you do want to buy the book – you can purchase it on my website.